There laid they Jesus therefore because of the Jews’ preparation day; for the sepulchre was nigh at hand (Jn 19). For Mark, Jesus is the Son of God; for Matthew, He is King; for Luke, He is Saviour. But for John, Jesus is the spotless Lamb of God who was ritually bled so that no drop of blood remained in him. God so loved the world that He gave His only begotten Son, who was with Him at the creation of the world, to die the agonising death of a cursed criminal. The cross that killed the Son of God blotted out our every sin: that which was torture for Him was a sweet gift to us – the path to eternal life. The day of Christ’s crucifixion coincides this year with the Jewish commemoration of the Passover, just as it did in AD33. As Christians meditate upon the Lamb of God who was led to the slaughter, Jews recall the time the Israelites escaped slavery in Egypt by marking their doorposts with the blood of a pure lamb so that the Spirit of the Lord might pass over their homes in the slaughter of the first-born. The Lamb hangs on His cross, nailed there by our selfishness, our pride, our fits of anger, our lies, jealousy, greed and intolerance. We drove those nails into His feet and hands. 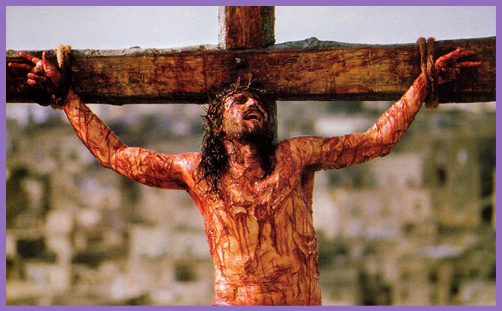 Yet even in His deepest agony, He was forgiving us. Jesus died the death of Israel’s Messiah at the hands of the Romans, at the request of the Sanhedrin, by the will of the people. He was crucified by Pontius Pilate, but it was a democratic crucifixion; a referendum on Christ’s prophethood and messianic claim. And Jesus lost: the people elected Barabbas as their saviour. There were no signs and wonders; no apparent divine intervention; no empiric liberation. The death of Christ brought His disciples to the very depths of despair: they were abandoned, mocked and disillusioned. One had betrayed; another was afraid; and yet another doubted. The rest possessed within their hearts the peace which passes all understanding: an assurance; a hope that their time of testing might pass and that the curse of death might be conquered. They did not know; they believed. And the message they believed has been central to the Christian faith for almost 2000 years. It is one that has to be continually reinforced at times of stress, despair and danger; at moments when faith is tested and the will to overcome is undermined. This is why Good Friday is so central in its symbolism. The descent of darkness, the portents of destruction, the expiry of vision and hope. It is the Good Friday that comes to every person at different times, when failure robs life of all meaning, joy and love. It is the collapse of enterprise, confidence, relationship and dignity. It is both the torment of a child abandoned by a father, and a father’s grief at the loss of a child. It is the descent into hell. God-forsakenness is something we might all feel, but, unlike Jesus, we never actually experience it. At His moment of mortality, He was nothing but an outcast and humiliated slave. When our moment comes, we are sanctified in His Shekinah and our fellowship will be consummate. Christians endure what Josephus referred to as “that most wretched of deaths” on Good Friday because of the sure and certain eschatological hope of the Resurrection, which sustains us through the despair. This life does not promise the joy and ecstasy of the Easter event: that is for another place. All we can expect on earth is to be persecuted for the sake of righteousness: the world will hate us, but it hated Him first. Today is a time to reflect, remember, re-enact how our sin brought Jesus to his death on Calvary, and what that death meant for our sinfulness and redemption. The gospels present the death of Jesus in the light of His life and the good news He preached. God delivered up His Son – surrendered Him – quite deliberately: the first person of the Trinity cast out and annihilated the second in order that we might be redeemed. In the infinite grief of that kenosis is perfect love. How can we not be grateful? Love so amazing, so divine, demands our souls, our lives, our all.